Thorndon is a historic inner suburb of Wellington, the capital city of New Zealand. Comparatively level Thorndon contained hilly Wellington's elite residential area until long after motorised transport became usual but the best of its heart was almost entirely destroyed in the 1960s by a new motorway and the erection of tall office buildings on the sites of its Molesworth Street retail and service businesses. Thorndon combines upmarket residential accommodation and the home of government, and is located at the northern end of the Central Business District. 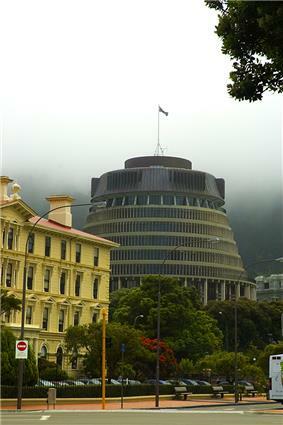 The buildings (dating from 1899) of the New Zealand Parliament are located in Thorndon. Thorndon is also the location of many Government departments including the National Library (1987) and Archives New Zealand (1957). Thorndon is surrounded by major transportation links. To the west, towards the foot of Te Ahumairangi Hill (formerly known as Tinakori Hill) which hangs above the suburb, is the Wellington Urban Motorway, part of New Zealand State Highway network. Schools located in Thorndon include Wellington Girls' College (1883), St Mary's College (1850), Queen Margaret College (1919) and primary schools Thorndon School (1852) and Sacred Heart Cathedral School (1850). Thorndon is home to two Cathedrals: Anglican St Paul's Cathedral (completed in 1998) built to replace the former pro-cathedral, Old Saint Paul's (1866) and Catholic Sacred Heart Cathedral opened in 1901 to replace the destroyed St Mary's Cathedral dating from 1851. Katherine Mansfield Birthplace is located in Thorndon, and is the house where Katherine Mansfield grew up. The Thistle Inn is one of New Zealand's oldest public houses, originally built in 1840. Artist Rita Angus lived in Thorndon from 1955 to her death in 1970. Her 1877 cottage is now used to host the Rita Angus Residency for visiting artists. Westpac Stadium, one of New Zealand's top sports venues, is located nearby and the Thorndon Tennis (and Squash) Club, established in the 19th century, is one of the oldest in the world. Many embassies, high commissions and consulates are located in Thorndon including: the US, Chinese, Cuban, German, Italian, Philippine, Thai and Turkish Embassies; the Australian, British, Canadian, Cook Islands, Fijian, Indian, and Niue High Commissions; and the Norwegian and Swedish Consulates-General. The Thorndon Fair is held annually, usually on the first Sunday of December. The fair has many stalls selling crafts and second-hand goods and is held for the benefit of Thorndon School. It has taken place for many years and is one of the main community events held in Thorndon. Parts of Tinakori Road and Hill Street are closed during the fair. 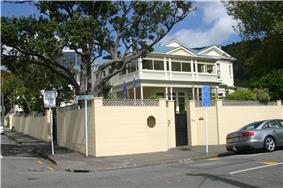 Thorndon occupies the northern end of the narrow coastal plain that makes up the heart of Wellington. It is flanked by the green hills of Wadestown to the west and the port facilities of Wellington Harbour to the east. The boundaries of Thorndon form an approximate triangle. Starting from the lower south-west corner, at the intersection of Glenmore St and Collins Tce, the boundary goes up through Tinakori Hill, across through Weld St and along to Baker St. Then the boundary follows the west side of Thorndon Quay down until Hill St, where it goes across to Bowen St, Tinakori Road and Glenmore St (until Collins Tce). One of the few comparatively flat areas on the harbour, Thorndon became a significant part of Port Nicholson's first organised European settlement in 1840. European settlers built their houses alongside the Maori settlement of The New Zealand Company. Sir Robin Cooke, who grew up beside the Thorndon tennis club, took the title of Lord Cooke of Thorndon when raised to the peerage - although prior to his death on 30 August 2006 he lived in Karori. 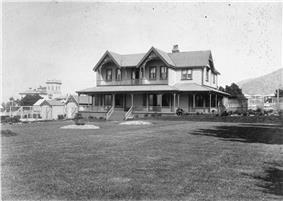 ^ both her birthplace and her family's residence after 1898 at 75 Tinakori Road — destroyed for the motorway. ^ Paul Goldsmith and Michael Bassett, The Myers, David Ling Publishing Ltd, Auckland, 2007.